Central Texas Tae Kwon Do is a Martial Arts School offering Brazilian Jiu-jitsu, Tae Kwon Do, Kick boxing & stick & knife training We are the only certified Haidong Gumdo school in central Texas. classes in Temple, TX for kids, men and women. 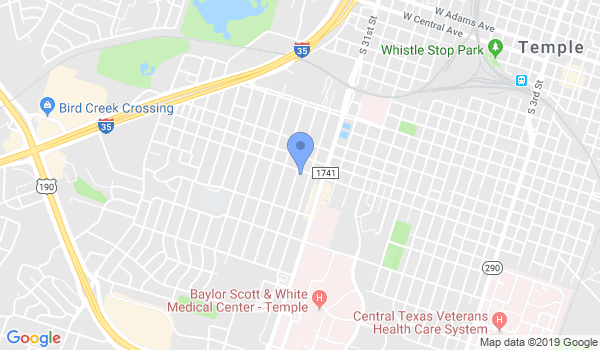 Central Texas Tae Kwon Do is Located at 1719 W Ave. M.
View a Location Map, get Directions, Contact Central Texas Tae Kwon Do or view program details below. If you are a student at this school, help your local Martial Arts Community by writing a Review of Central Texas Tae Kwon Do. You can also help your school by sharing it on Facebook, Twitter, Google+, Pinterest etc. stick & knife training We are the only certified Haidong Gumdo school in central Texas. Monday - Thursday 4-7yr old 5:45pm-6:30pm Monday,Tuesday,Wednesday,Thursday advanced class 7yr old - adult 6:30pm-7:30 and Friday 5:30-6:30 Sparring. Tuesday and Thursday 5:45pm-6:30pm Tiny Tigers 4-6 yrs old.Haidong Gumdo Monday Wednesday 7:30-8:30 and Friday 6:30-7:30. Saturday 1:00pm-3:00pm Team training,cardio/endurance training Saturday 3:30-4:30 Haidong Gumdo. Would you like more information on hours, classes and programs available at Central Texas Tae Kwon Do? Please contact the school with your questions. Update the details, Write a Review or Report Error of Central Texas Tae Kwon Do. View all Dojo in Temple or in Zip code 76504. This Chart shows the Martial Arts Styles offered most in Temple, Texas area. View a list of Dojo in Temple, or enter your address below to find schools closest to you.